The White House is the official home and principal workplace of the President of the United States of America. The house is built of white-painted Aquia sandstone in the late Georgian style. 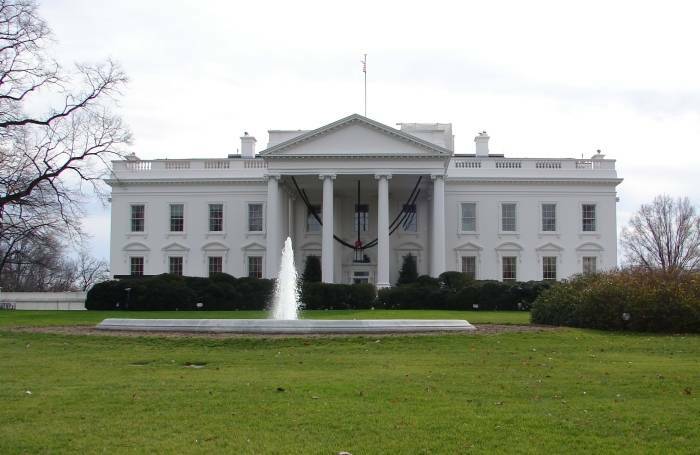 It is located at 1600 Pennsylvania Avenue in Washington, D.C. As the office of the U.S. President, the term "White House" is used as a metonym for a U.S. president's administration. The property is owned by the National Park Service and is part of "President's Park." Construction began when the first cornerstone was laid in October of 1792. Although President Washington oversaw the construction of the house, he never lived in it. It was not until 1800, when the White House was nearly completed, that its first residents, President John Adams and his wife, Abigail, moved in. Since that time, each President has made his own changes and additions. The White House is, after all, the President’s private home. It is also the only private residence of a head of state that is open to the public, free of charge. Presidents can express their individual style in how they decorate some parts of the house and in how they receive the public during their stay. 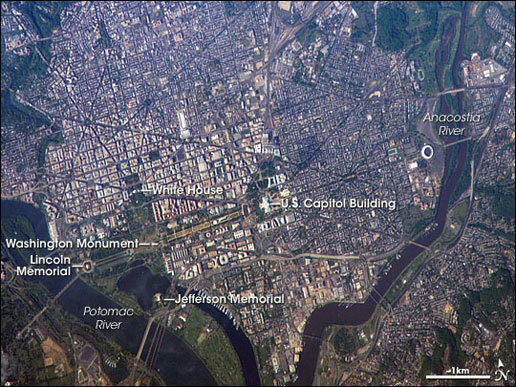 Thomas Jefferson held the first Inaugural open house in 1805. Many of those who attended the swearing-in ceremony at the U.S. Capitol simply followed him home, where he greeted them in the Blue Room. President Jefferson also opened the house for public tours, and it has remained open, except during wartime, ever since. In addition, he welcomed visitors to annual receptions on New Year’s Day and on the Fourth of July. In 1829, a horde of 20,000 Inaugural callers forced President Andrew Jackson to flee to the safety of a hotel while, on the lawn, aides filled washtubs with orange juice and whiskey to lure the mob out of the mud-tracked White House. After Abraham Lincoln’s presidency, Inaugural crowds became far too large for the White House to accommodate them comfortably. However, not until Grover Cleveland’s first presidency did this unsafe practice change. He held a presidential review of the troops from a flag-draped grandstand built in front of the White House. This procession evolved into the official Inaugural parade we know today. Receptions on New Year’s Day and the Fourth of July continued to be held until the early 1930s. The West Wing is the building housing the official offices of the President of the United States. 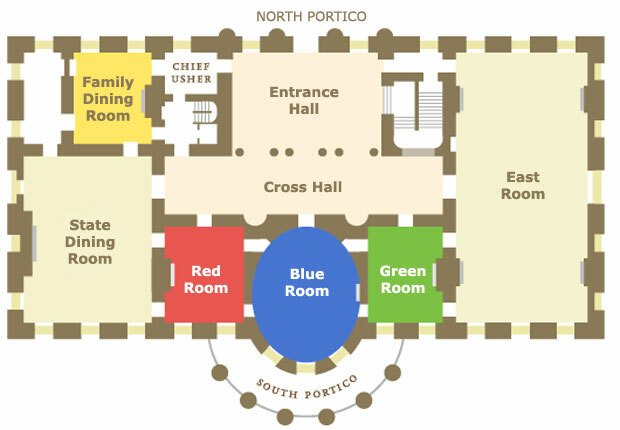 It is the part of the White House Complex in which the Oval Office, the Cabinet Room, the Situation Room, and the Roosevelt Room are located. 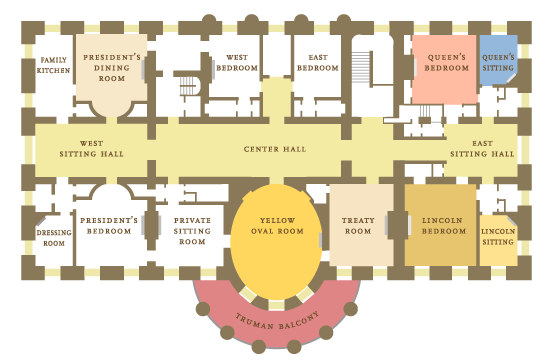 Besides serving as the day-to-day office of the President of the United States, the three floors of the West Wing include offices for senior members of the Executive Office of the President of the United States and their support staff. 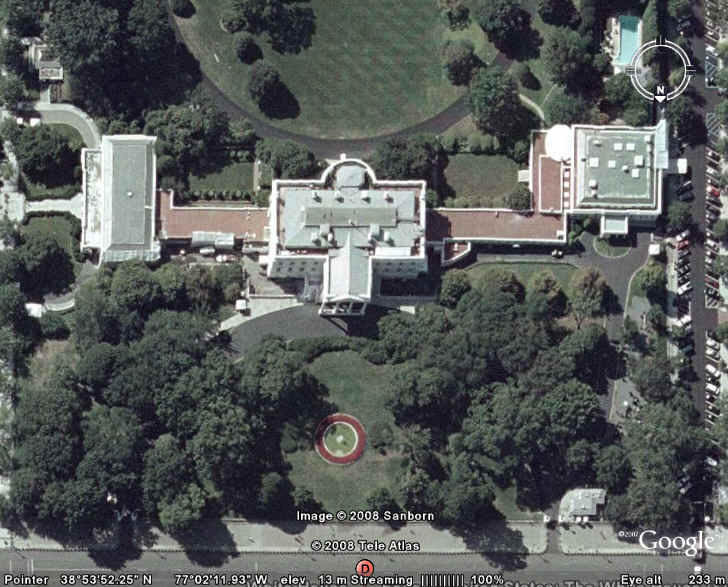 The West Wing is located directly west of the Executive Residence and is largely concealed from view by trees because its height is lower than the main structure's. The East Wing is a part of the White House Complex. It is a two-story structure on the east side of the White House Executive Residence, the home of the President of the United States. 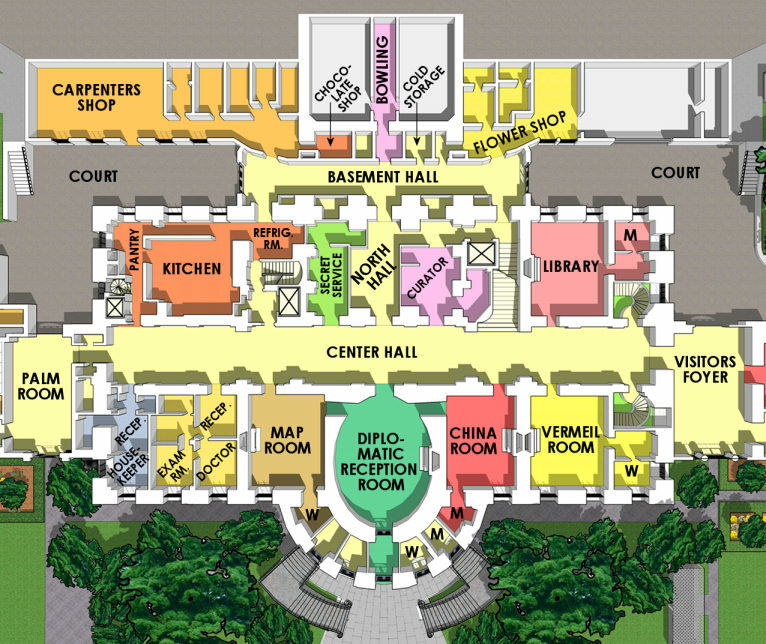 The East Wing also includes the White House theater, the visitor's entrance, and the East Colonnade, a corridor connecting the body of the East Wing to the residence. Social visitors to the White House usually enter in the East Wing. On an early October morning in 1909, President William Howard Taft became the first President to walk into the Oval Office. Greeting the 27th President of the United States were silk velvet curtains and a checkerboard floor made of mahajua wood from the Philippines. Caribou hide tacked with brass studs covered the chairs in the room. President Taft chose the olive green color scheme. The Oval Office was different from the office of President Theodore Roosevelt, who built the West Wing in 1902. Roosevelt's office was rectangular. 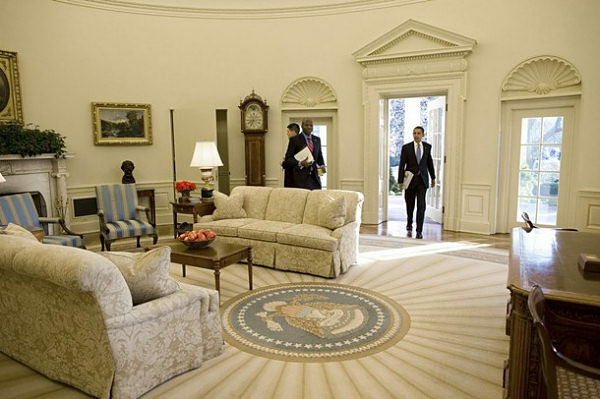 Taft relocated the office and changed its shape to oval, like the Blue Room in the White House. Preferences for oval rooms date to the time of George Washington. At the president's home in Philadelphia, Washington had two rooms modified with a bowed-end in each that were used for hosting formal receptions called levees. As his guests formed a circle around him, Washington would stand in the center to greet them. With no one standing at the head or foot of the room, everyone was an equal distance from the president. The circle became a symbol of democracy, and Washington likely envisioned the oval Blue Room as the ideal place to host a levee. For President Taft, the Oval Office may have symbolized his view of the modern-day president. Taft intended to be the center of his administration, and by creating the Oval Office in the center of the West Wing, he was more involved with the day-to-day operation of his presidency than were his recent predecessors. 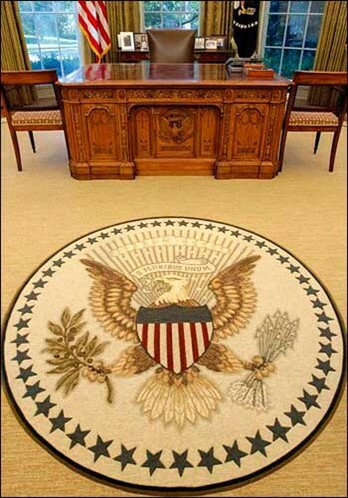 What President Taft could not imagine in 1909 when he built the Oval Office was that the office itself would become a symbol of the Presidency. Over the years Americans developed a sentimental attachment to the Oval Office through memorable images, such as John Kennedy, Jr. peering through the front panel of his father's desk or President Nixon talking on the phone with astronauts after a successful voyage.